For the last couple of days, as I've been getting over my Christmas illness, I've been investigating the OH's Priestley ancestors. Robert Priestley, his 2x great grandfather, b.1846 in North Collingham, Nottinghamshire arrived in Barnsley just before the 1871 census and settled in the densely packed south-east Ward. Extending from the edge of town and including the old Wilson's Piece area, the housing in this Ward had, by the early part of the 20th century spread up both sides of Sheffield Road and across the Barebones area of Heelis Street and Duke Street, over the junction with Park and Cemetery Roads and up towards the Worsborough Common boundary to the south-west and down to the cemetery walls on the south-east. Two previous posts explain how the Registers of Electors for Barnsley helped me find Robert's addresses between 1888 and 1899 and what effects the standards of housing in the area may have had on the mortality of Robert's children. Today I'm going to write about the family's experience in the First World War. Robert, a widower, had six surviving children when war broke out in August 1914. All three daughters and one son had married and between them he had eleven surviving grandchildren. His eldest son Robert (b.1873) was unmarried and lived with his father at 9 Duke Street, as did the youngest son, Walter Clarke (b.1896). One daughter, Mary Jane (b.1884), having experienced some trouble in her marriage, was also living with them, along with her three children. William (b.1876), his wife and five children, lived at 41 Britannia Street, just off Duke Street. Effie (b.1886), her husband Arthur Beevers and their three children lived at 74 Heelis Street, which runs parallel to Duke Street and finally Frances Mabel (b.1888), her husband Charles Jackson and one child, lived across town at 7 North Pavement, which is behind the current Town Hall. Charles Jackson is the first of the extended family to enlist, joining the embryo 1st Barnsley Pals on 30th September 1914. He had previously been a Coal Miner. He is followed by the young Walter Clarke Priestley on 2nd February 1916, who handily adds a year to his age to be allowed to enlist for overseas service (you needed to be nineteen years old at that point). Four days later William, his older brother, enlists too, both of them ending up in the new 2nd Barnsley Pals. Both Walter and William had been glassworkers at Rylands Glass at Stairfoot. Arthur Beevers, their brother in law, enlists on 23rd of February, joining the brothers in the 2nd Barnsley Pals. He gives his previous occupation as Labourer. Jon Cooksey's book Barnsley Pals, describes how the men initially drilled on the Queen's Ground in their own clothes and slept at the Public Hall until accommodation was ready for them at Silkstone Camp. 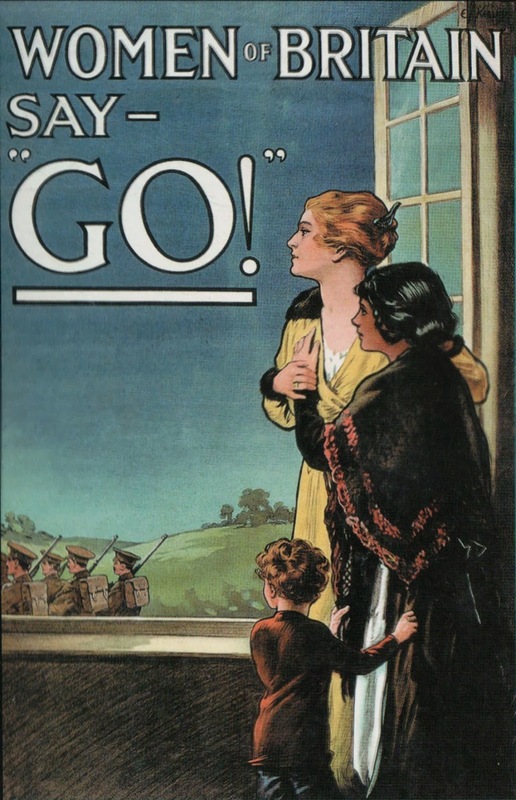 The battalions did not go abroad until December 1915. 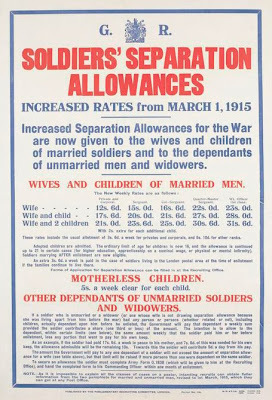 During these early months it would be very easy for the men living around the town to pop back home to see their wives, and given the children born to the family in 1915 and 1916, their wives were probably in two minds about it all. Frances Mabel Jackson was born on 15 February 1915 and duly added to her father's service record. As you can see the records give details of Frances Mabel's marriage to Charles, handy if, for example, the marriage had been in a Register Office and you have no cheap way to obtain the certificate. For some reason Charles is transferred to the West Yorkshire Regiment in July 1915 and is sent to Malta as part of the garrison. He moves onto France in May 1916 where he is wounded in August (gunshot wound left leg and shell shock) but does not returns to England until October. He seems to be in Ripon (a central army camp for transfers and discharges) in March and April 1917 and is punished for being absent without permission for a week, which would fit with the conception of his third child, Alice, who is born towards the end of the year. He must have healed from his wound but been unfit for service at the front as he is transferred to an Agricultural Company in the Labour Corps. He must get some more leave as his fourth child, Harry is born at the beginning of 1919, and eventually he is discharged in March 1919. Altogether Charles had been away from home and his wife, Frances Mabel (nee Priestley) for four years and five months. 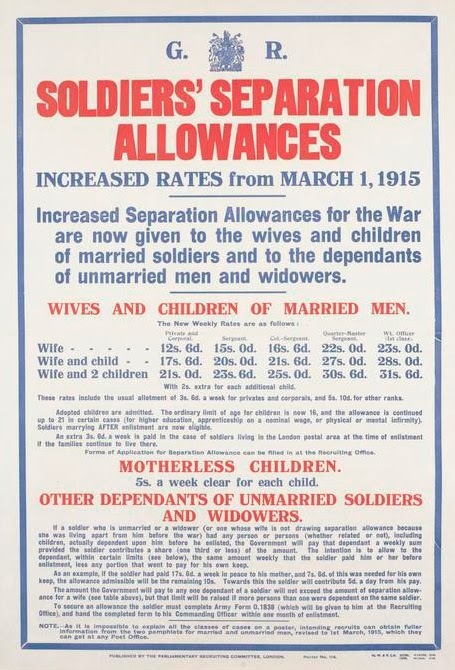 In that time she has given birth to three children and somehow managed to live with a growing family on the army separation allowance for a private soldier of 17/6 (for wife and one child), 21/- (for two children) and so on, increasing by 2/- (two shillings) for each extra child. Charles would also have made an 'allotment' to her from his pay, which as far as I can find via Google was 3/6 a week. So her total income with two children (from 1915 to late 1917) would have been 24/6. As there were 20 shillings in a pound that's just one pound, four shillings and sixpence. Remember that Charles had been a Coal Miner before he enlisted, he could have been on more than £2 a week for just himself, Frances Mabel and one child. Of course she wasn't having to feed and clothe Charles and we don't know how much of his pay he had been accustomed to give her before the war, but in Barnsley there is a tradition that the husband gives all his pay to the wife and she gives him back pocket money only. I can't help but think that she must have been much, much worse off. This blog post is getting very long and the OH has come home from work ... I'll call it part one and carry on tomorrow.